Hydronic balancing is paramount for the efficient operation of a heating system. To achieve this, the volume flow is co-ordinated with each terminal unit. 17 graduations. The valve insert, which is available separately, can be replaced by using the special tool “Demo-Bloc”. 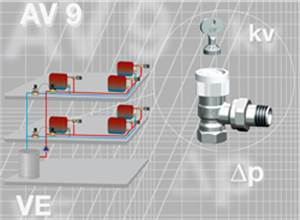 The valves of the “Series QV” are thermostatic valves with an automatic flow controller and a setting scale. 17 succeeding presetting values allow adjusting the nominal value between 10 and 170 l/h. To carry out hydronic balancing, the determined maximum flow rate required for each terminal unit can be set directly at the valve and be maintained at a constant level. A complex calculation of the presetting value is no longer necessary. 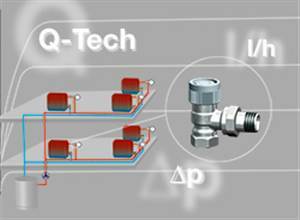 The integrated regulator ensures that the differential pressure within the “QV” valve remains constant and is not affected by pressure variations in the heating system. The valve insert, which is available separately, is especially suitable for the modernisation of existing heating systems as it fits all “standard” Oventrop thermostatic radiator valve bodies with connection thread M 30 x 1.5 (manufactured since 1999). The valve insert is replaceable without draining the system by using the special tool “Demo-Bloc”.